Stewart Bowman, Peter "Rabbit"(Tenor Drummer)?, George Black jr.
consistency brought them overall recognition. On the left is Pipe Major George Roger holding the Champion of Champions Shield for Grade two. 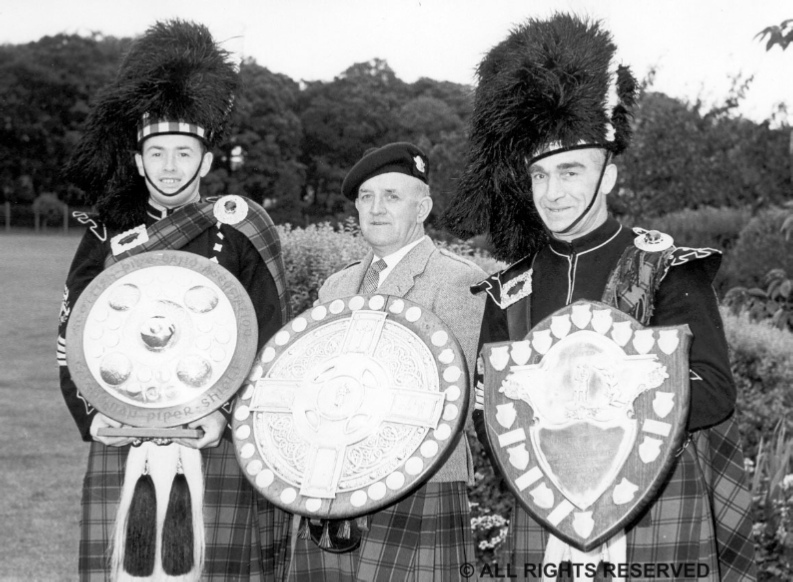 In the centre is George Black senior holding Sir Harry Lauder Shield for 1st place at Cowal. Perhaps someone out there can tell me what trophy Drum Major Andy Adamson is holding. George Raitt, Leading Drummer Andy Adamson, Jim "The Bass" Taylor, Bruce Abbot, and George Black jr. 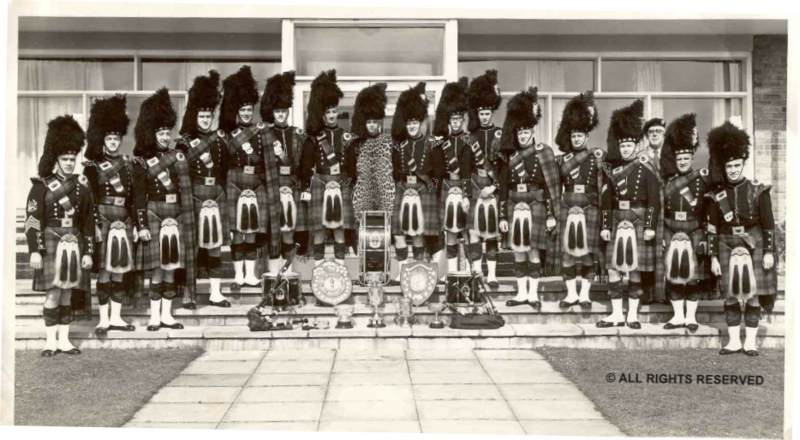 The NCR Pipe Band came into being on 11th March, 1957, following a meeting held in the canteen of Block four. 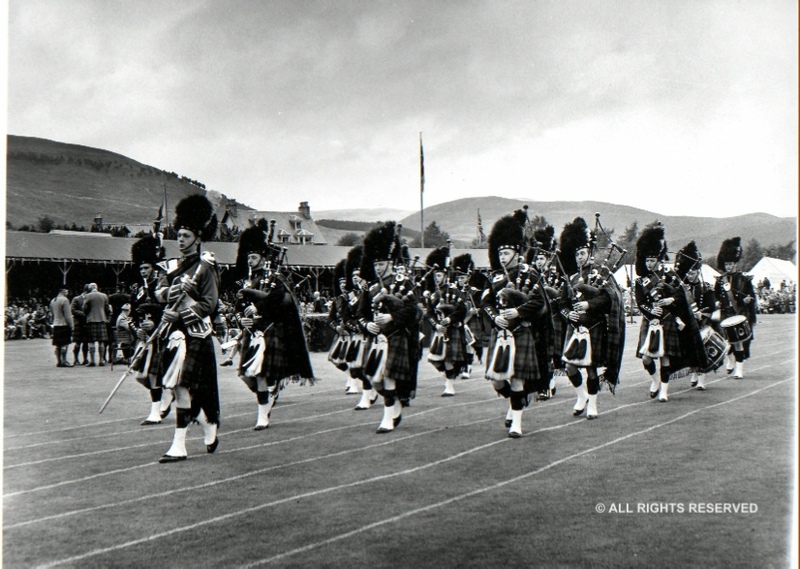 At this meeting, Jimmy McIntosh MBE., was appointed as their first Pipe Major and George Black senior was appointed as their first Drum Major/Leading Drummer. With a leadership like this, the band were sure to taste success and by the early 1970's they had been successful as far as Grade two by winning the major honours. They proudly wore the Red Robertson Tartan in the style you see above. The Leading drummers were well served by Andy Adamson and Bruce Abbott. The band discipline was handled up front by Arthur Guthrie, who eventually emigrated to New Zealand. This was not before passing on his expertise to the young "Drummie" you see in the photo, David Alexander. I well remember seeing both of them on parade during the sixties. The final Drum Major was also no slouch. Malcolm Stewart was a member of the MacKenzie Caledonian Pipe Band where he was placed in the World Championships in 1966 in Inverness. Shortly after that, and by coincidence, he was employed by the NCR and Malcolm moved on amicably to first of all play the Bass before returning to his favoured Drum Major roll. Malcolm was equally at home with Bass, Tenor or Big Stick. The NCR company suffered through "down-sizing" like many other companies, and the loss of key players meant that the band eventually folded. In ten short years, this band had been started, tasted great success and then declined to nothing once more. This does not seem much when said quickly, but during that time they made friends by playing at home and abroad, won many prizes and at the end of each season they donated the proceeds to various charities. Even today, bands in and around Dundee still boast having ex-members of the NCR. 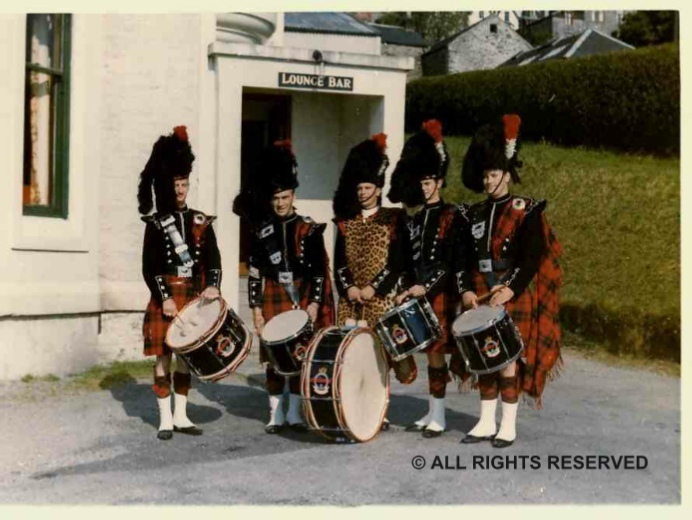 We are still looking for the remaining and any backgrounds of these Pipers. 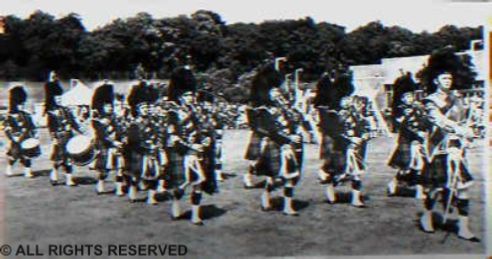 For those interested, get onto UTUBE and type in "NCR 1956"
This is super piece of local history and is a manufactured piece of film for the National Cash Register Company and lets you have an entertaining look and listen to the brand new NCR Pipe Band. There is some doubt about the year 1956 and it has been suggested that the film mat date to as late as 1961, but I do not know for sure. I always thought that the NCR Company didn't arrive in Dundee till 1958 which would make the Band coming into being after that. I see Jimmy McIntosh as Piping Major, Thorfin Drever in the front rank, Colin Stewart and Harry Troup in the back rank of pipers. We would like to ID more and I would assume that George Black senior and Andy Adamson could be there somewhere. Can you tell us more?